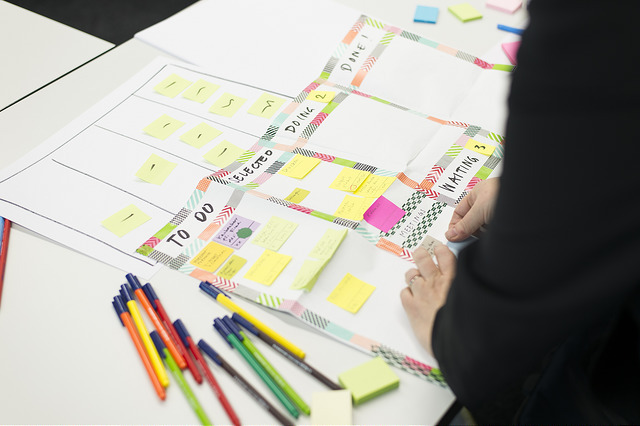 Since the brain processes visual information 60,000 times faster than text, Kanban Method uses a visual system to improve communication in organisations. Using sticky notes on a whiteboard helps to create a ‘picture’ of your work. 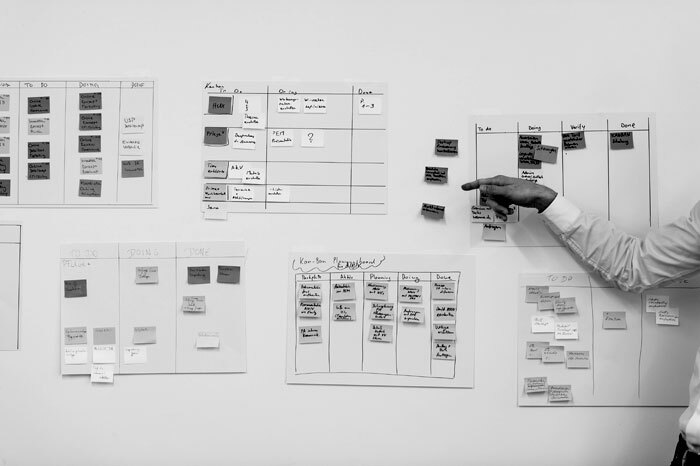 Kanban (Japanese for ‘visual signal’ or ‘card’) was developed by Toyota to help define, manage and improve services through the use of whiteboards. The boards act like mirrors, in that they ‘reflect’ the organisation’s current flow of work. Kanban helps employees know how their work works. The method facilitates a design management and enterprise alignment, to minimise delays. A shared ‘vocabulary’ that clearly defines work items and processes. Kanban focuses on the customers and on what is delivered. The goal is to provide services that are fit for purpose to customers. With a balance between demand and capability we can improve the performance of services, and increase both customer satisfaction, and staff collaboration. If demand outstrips capability then it is a natural point to look for a change in an organisation. It makes sense to make the intangible work visible in order to see what is happening and how to reduce overburden. This makes immediate positive impact. 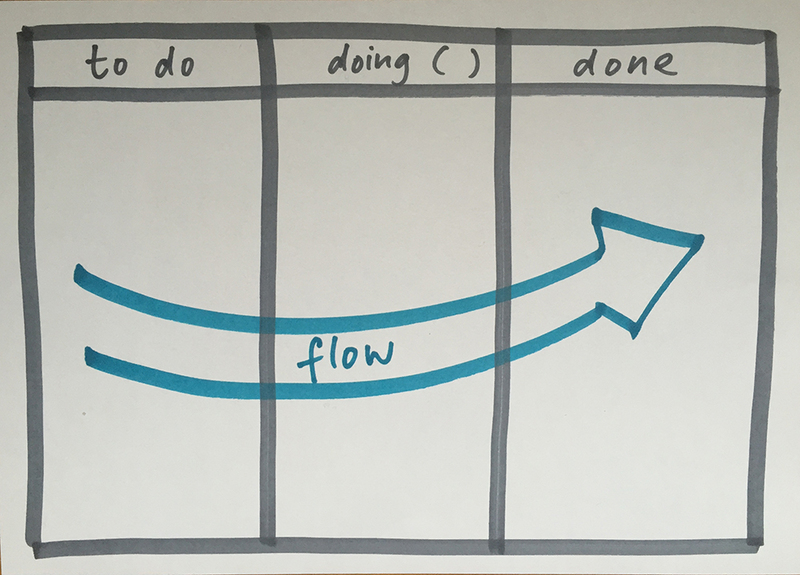 Kanban limits the Work in Progress (WiP) through a ‘pull’ system. In pull system new work is pulled only when other work is complete and staff are ready, rather than pushing work into the system when new work is in demand but staff is not ready. 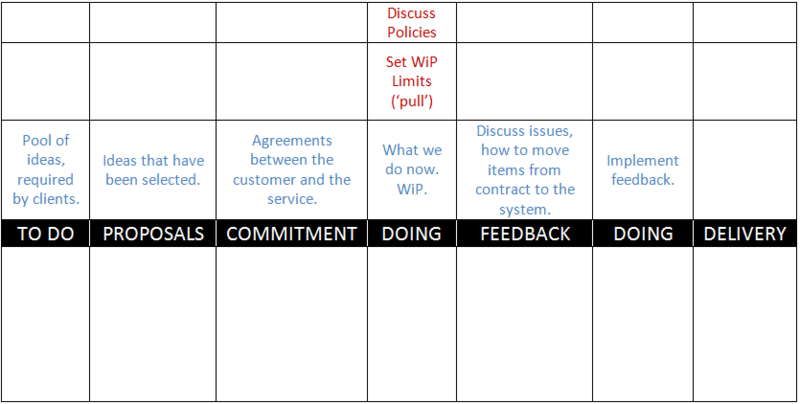 Limit WiP – Kanban concept. (Image: Flickr/Nadja Schnetzler. CC BY 2.0). 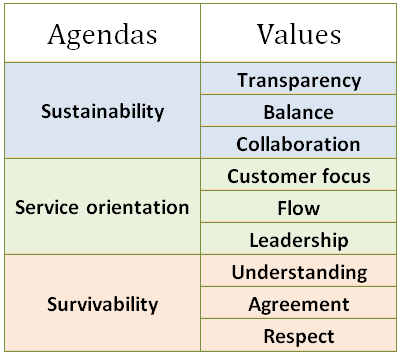 The agendas and values define how to start look at an organisation. Sustainability: developing a sustainable pace to improve. Service orientation: focus on performance and customer satisfaction. See customer satisfaction as the measure of performance. Survivability: looking at how to be competitive by being adaptive. Transparency: Sharing information openly. This improves the flow of business value. It requires clear and straightforward vocabulary that everyone understands. Balance: Balancing capacity with demand. Also, allowing for different viewpoints. Customerfocus: Knowing the goals of the system. Working towards the goal, the ‘point of realizing the value’ – which is when a product is actually created and the customer receives it. Flow: The work is in a flow; it is continuous. Leadership: Inspiring others to take action through example, words and reflections. This is not hierarchal structure but developing leadership at every level of the organisation. Understanding: Self-knowledge of the individuals and the organisation. An improvement process where you know the starting point. Agreement: Moving together. This is not management by consensus; but a dynamic co-commitment to improve. Respect: Valuing and showing consideration to people. The principles explain the reasons; the logic behind Kanban – the ‘why’. There are two groups of principles: management and service delivery. Accepts that current processes along with their challenges do contain wisdom and resilience. Evolutionary change from within – we should not impose solutions from different contexts but from within the organisation; from within existing processes in a natural course that evolves. Do not start with a radical change. Leadership at every level – encourage and nourish leadership at all levels; within the bottom ground and also within senior management. Customer needs – understand and focus on the customers. Self-organise – let people self-organise and manage their work. You can point out a final goal, but allow colleagues to organise their work by themselves. Evolve policies – improve policies to fit purpose. Time spent worrying about what those you supervise do is time you should be devoting to the satisfaction of your clients. Kanban is applied to knowledge work where deliveries consist of information in various forms rather than physical items (products). Kanban board describes the flow of items in the system, for the purpose of minimizing delays in each work item. A pool of ideas – the customers’ requests. Proposals – ideas that are selected from the pool by those who do the work. Limits are set on these as to how many there are. The service will be produced and delivered to customer. Contracts – Work in Progress (WiP). Proposals are selected, developed, and accepted. These are six essential activities. These practices involve setting the work and the policies that determine the processes. Improving the processes through evolutionary fashion, which means keeping and amplifying useful change, learning from feedback and revising. Commitment and delivery points must be defined. Work in Progress Limits must be displayed. 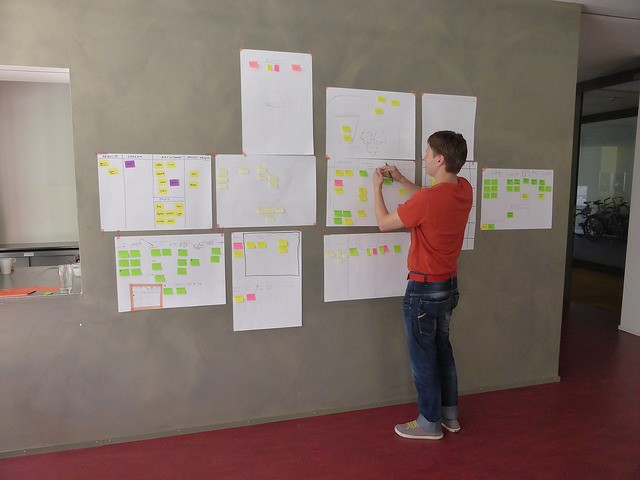 Through the Kanban board we can visualize the work and the process it goes through. Moving away from a push system to a pull system. In pull, new items are not started until earlier work is complete. 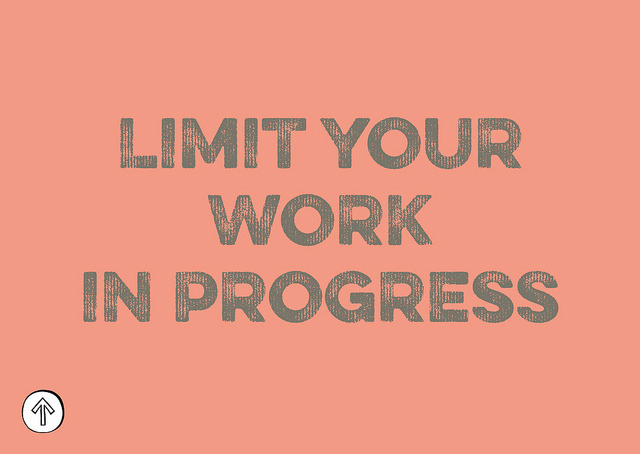 Observe, limit and optimize the amount of work in progress. This process of limiting work actually maximizes WiP. By contrast, ineffective management behaviour focuses on maximizing usage of people and resources, trying to ensure everyone is busy with a ready supply of work. This can overwhelm people. The flow of work can be evaluated through the value of cost of delay (CoD); the amount of items’ value that is lost. Value lost occurs by delaying service’s implementations and by the rate at which the value changes. Service level expectations – what customers expect. Service level capacity – what the service can deliver. Service level agreement – agreed with the customer. Service fitness threshold – the unacceptable level of service, below the agreed. Make policies visible, whether on the board or in electronic display (or other means). Policies must be defined and agreed before any work item is moved from one column to the other. This will articulate the process that goes beyond the workflow definition. Policies need to be sparse, simple, well-defined, straightforward, and visible. They need to be applying and readily changeable by those providing the service. Some policies can produce counter-intuitive results. That’s why we need to make them explicit. WiP Limits are one type of a policy. If you set limits to WiP you need to challenge this. If you never challenge it, you will not try to change or break the limits, and you will not improve. This will be poor application of this practice. With politics there needs to be a clear, agreed definition of what is considered as ‘done’. Feedback helps control processes and is important for change that progresses evolutionary. Feedback occurs in meetings and in reviews. Too frequent feedback may compel changes before seeing the effect of previous changes. Too less feedback may cause poor performance that may persist longer than necessary. Feedback is useful for strategy alignment, operational coordination, risk management, and service improvement. It facilitates decision-making at each level. Strategy review: select services to be provided. Look at what fits for purpose. Discuss how the external environment is changing. Operational review: Look at the balance between your services. Deploy resources between your services to maximize delivery. Risk review: any internal issues. Service delivery review: Look at a single service. Replenishment meeting: Discuss how to move items from commitment point into the system. Kanban meeting: Daily coordination, self-organisation and planning reviews for by those collaborating on a service. Often, these meetings occur with people standing up, not sitting, to encourage short energetic discussion. Delivery planning meeting: Monitor and plan delivery to customers. Sometimes, transformation programmes start with an aim to change processes into new predefined approach. Kanban starts from the organisation as it is now in order to pursue continuous and incremental improvement. This is an evolutionary process that allows change to occur from within an organisations. In truth, organisations cannot opt out of evolution. It either works for them or happens to them. They can choose to encourage the change to occur from within, rather than coming to a point where they are unable to respond to threats from outside. Keeping and amplifying useful change while reversing what doesn’t work. First, recognize that your work involves a flow of a value from the request of an item to the delivery. 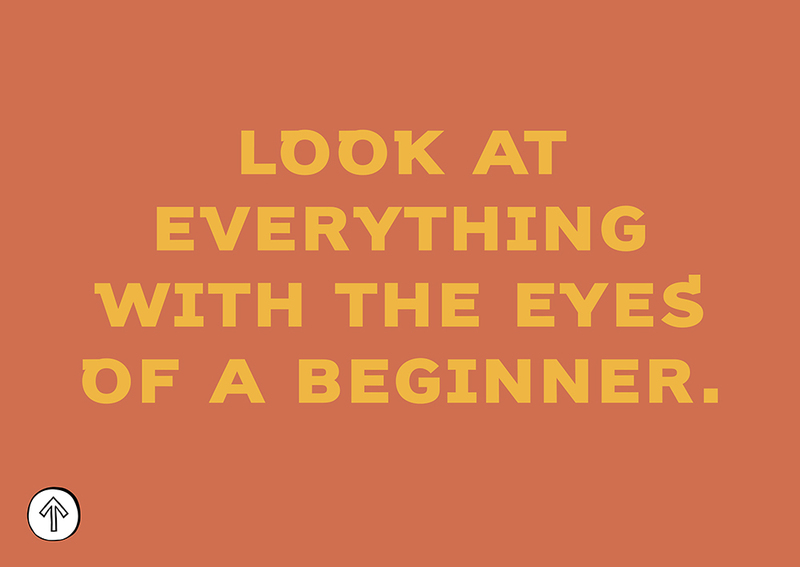 Then visualize the working process, and improve the process. Understanding how a system behaves as a whole, rather than through isolated parts. This helps define the steps needed to introduce change. The steps may not always be sequential but iterative – learning from one step to inform and influence another in a collaborative environment. These steps are applicable for just one service. When there are more services, use feedback processes to balance demand and flow. Services cannot be improved in isolation because this will result in sub-optimization. We need to consider the whole system. Sometimes you need to consider services delivered to clients, rather than internal processes delivered within the organisation. Step zero – identify your services. Step 1: Understand what makes it fit to purpose to your customer. Step 2. Understand sources of dissatisfaction with the system. Step 5. Module a workflow. Step 6. Discover classes of services. Step 7. Design Kanban system. Step 8. Put the system on a board and negotiate implementation. We want to embrace customer focus, and manage work in line with the service that you deliver. · Has the pull system approach been adopted? · Are Works in Progress limited on the whole system level, not just a personal level? Is customer focus always understood and is it a reason for changes? · Is scheduling occurs based on pull system? · Are commitment and delivery points clearly defined? · Is there regular replenishment meetings? Service should be based on major performance. · Are service levels understood and do they inform commitment to customers? · Are service levels based on lead times and delivery rates? · Does service delivery understand the risks, costs for delay, customer expectation? · Are they clustered into similar groups to be identified? · Can employees understand risks from different sources and different types of work? Initially, no-one receives new roles or job titles, as we ‘start with what we do now’. However, there are two areas of responsibilities, which are required once Kanban has been implemented. The responsibilities are relevant; not assigning someone a new job title. Service request manager – responsible for understanding the needs and expectations of customers. Service delivery manager – responsible for the flow of work delivered to customers. © Gil Dekel. 3 April 2017. Kanban by Dr. Gil Dekel is licensed under a Creative Commons Attribution-NonCommercial-ShareAlike 4.0 International License. Anderson, David., Carmichael, Andy. (2016) Essential Kanban Condensed. Lean Kanban Press: Seattle.